A few months ago CySEC released a circular, wherein apprised all brokers of the new rules. According to the rules, among other things, all regulated brokers should not only show the mid-price, but also the bid and ask price, as we can see, for example, in banks when exchanging currency. More about this Circular here: CySEC tightens the rules for binary trades. It is simply the difference between the Bid and Ask prices. Each asset, whether it is gold, silver, Google shares or currency pairs has their own bid and ask price. These prices are slightly different. Why do they exist? The difference between these prices is the fee that the bank charges for mediating the exchange. Binary options brokers would only show us the mid price (average bid and ask prices) until now and this is what CySEC doesn’t like. 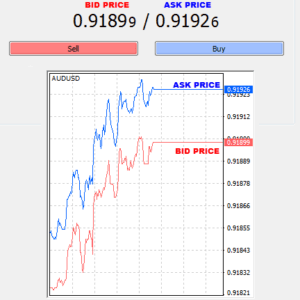 The first platform to show mid-price is Spot Option, which is used for example by the broker Optiontrade or Banc de Binary. In the picture below you can see how this platform provider displays bid and ask price. Another change that could affect binary options platforms will have to be full transparency of the quoted prices. Thus, if the broker offers trading with oil prices, they always have to tell customers (traders) the exact asset’s name with it’s origin. It is not enough to show a price of oil, but also that the price has been obtained from TI Crude Oil (Dec 15) NYMEX. Newly CySEC also mentioned that they are expecting a smooth display of current prices updated at least every second from the binary options brokers. The price will therefore have to be updated frequently so we, traders, always know what we are dealing with. Other brokers such as topoption or stockpair or their platform providers have still not managed to react to the changes. According to us, they are working on it, but they need to be very precise in order to assure a smooth flow of the platforms or its safety. Brokers still have a few weeks to ensure that the changes are applied or they will either be fined for the delay or their license will be removed. We hope that brokers will manage to apply the changes on time. News: Now other providers, such as Market Pulse or Tradologic (Broker Stockpair) show the prices too.